The Justin Kurzel 2015 film first made it past the video capture of a 2012 Polish-language version that played at Shakespeare’s Globe, then in the second round dispatched Geoffrey Wright’s 2006 Australian film with Sam Worthington. Nunn’s 1979 television version of his Royal Shakespeare Company production received–because of its number one seeding–a bye in the first round, then quickly dispatched the Shakespeare’s Globe production from 2014. 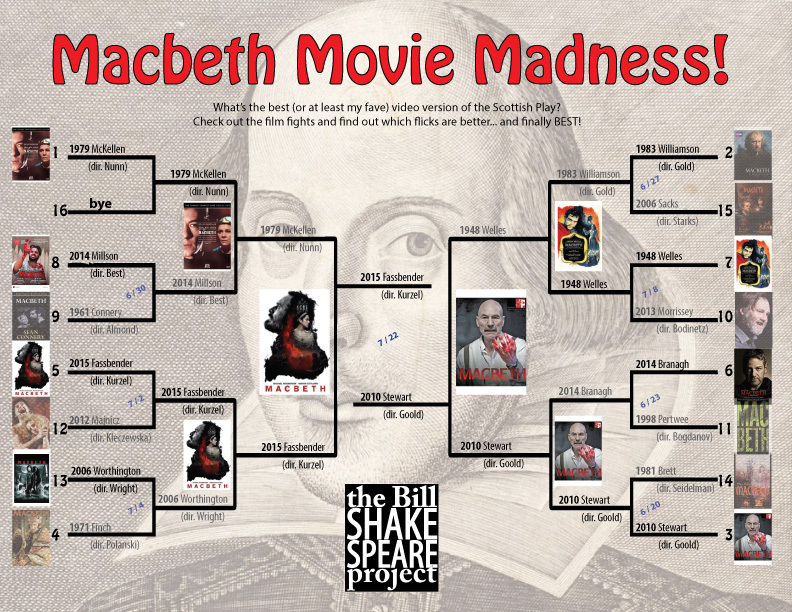 The contrasts between these two versions cannot be plainer: visceral vs. cerebral; beautiful cinematography vs. dark dark dark; attempts to explain subtext vs. coolly aloof presentation of characters; violence heaped upon violence vs. no deaths committed by Macbeth on-stage/screen at all. Found in these wide differences there are pluses and minuses for each. Kurzel’s visceral approach works well with what I feel is an express elevator of a plot (though Nunn’s cerebral approach is nothing to be sneezed at). Kurzel’s sumptuous camera work is a positive, but attempts to contextualize the actions (PTSD, the Macduffs leaving the banquet) feels a bit too-on-the-nose at times. You can fault neither leads’ performances: Fassbender is turbulent, McKellen decaying; Marion Cotillard is sexual but internalized, Judi Dench coolly ambitious then tortured. McKellen’s performance has been cited by many as definitive…but… it’s a little too cold for my taste …I don’t think there is a definitive performance. Can I find fault with either? Sure, there are aspects of both that I could nitpick. But there’s nothing glaring that counts either one out. It comes down to a matter of personal taste. The Kurzel film has a drive to it that I feel best represents the play as a whole. So, in an upset, Fassbender knocks off McKellen and heads off to take on Stewart in the final Scottish Square-off!